Hello and Happy First Monday of the New Year! I wanted to mark this with something beautiful so I created this easy crochet necklace tutorial for you. For the biggest (magenta) flower, ch 5 and join to make ring. Rnd 1: Sc 5 in ring. Rnd 2: ch 9, sc in next st. Repeat this pattern around. Rnd 3: sc2, hdc2, dc5, hdc2, sc 2 in all petals. Cut a long tail, tie a knot and hide it in the stitches. Cut off excess. For the medium flower, ch 5 and join to make ring. Rnd 2: ch 7, sc in next st. Repeat this pattern around. Rnd 3: sc2, hdc2, dc3, hdc2, sc 2 in all petals. Cut a long tail, tie a knot and hide it in the stitches. Cut off excess. For the smallest flower, ch 5 and join to make ring. Rnd 2: ch 5, sc in next st. Repeat this pattern around. Rnd 3: sc1, hdc2, dc3, hdc2, sc 1 in all petals. Cut a long tail, tie a knot and hide it in the stitches. Cut off excess. Stack them up and sew them. I made a tulle pom-pom using this method but using only the point and middle finger instead, because I wanted a medium sized pom-pom. The tulle I used is elastic and dotted. It adds more cuteness to the whole project. 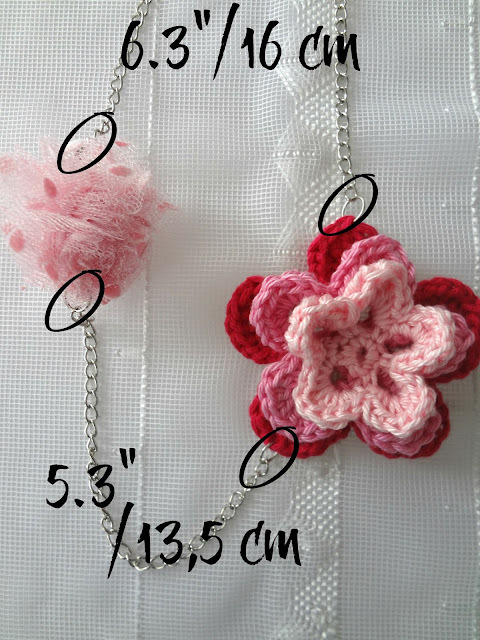 Add a jump ring to the pom-pom, attach a chain (mine is 5.3" or 13,5 cm) of your desired length and join it with the flower. 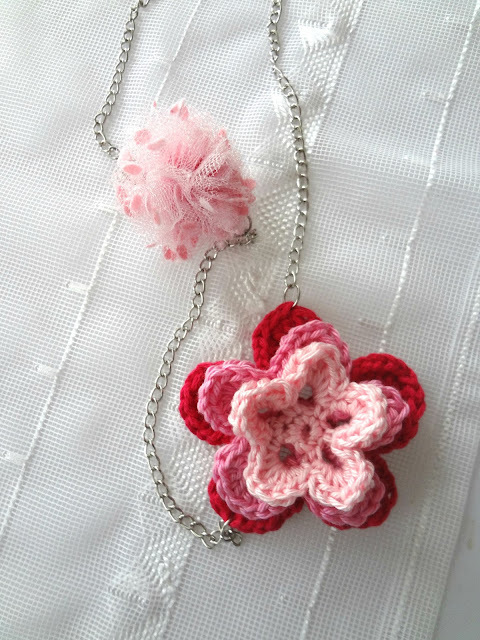 Attach jump rings on the top of the pom-pom and the flower for the side chains. They are 6.3" / 16 cm respectively. And that's it! I hope you like it and if you decide to make it I would love to see it. Drop me a note in the comments! Happy New Year Maya!! Your flower necklace reminds me of spring. Thank you for visiting Julie! This necklace is adorable! Thanks for sharing the flower pattern. Handsome necklace, Maya! Thanks for sharing!